One of your 50th birthday suggestions was that I should go and visit some interesting locations 50 miles from London, so I had a look on a map at where was up for grabs. Oxford and Cambridge for starters, plus Ashford, Newhaven, Worthing, Didcot and St Neots. I've only blogged a few of those before, so maybe I'll drop in on the others later in the year. But I thought I'd start off with the Essex bullseye, Britain's oldest recorded town - Colchester. 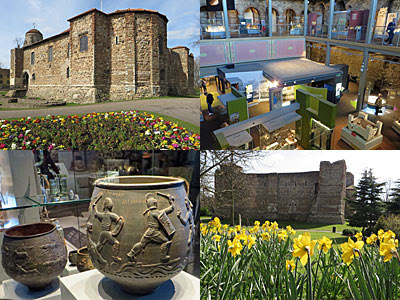 Colchester Castle: It's the largest Norman keep in Europe. That means it's not especially beautiful, certainly not the fairytale turreted castle you might hope, more a blocky stone wall surrounding a central courtyard. That's been roofed over to create a museum where the focus is very much on the town's history rather than the building itself. The castle stands just off the High Street and the top of a municipal park that rolls down to the River Colne. It's looking very springlike at present, with a grandstand of daffodils nodding on the bank facing the castle moat. One outer room is visible before you reach the cashdesk (£7.60, since you ask), where for an extra quid you can pick up a tablet loaded with an exploratory app. They're very popular, and very smart, but some of the many children present did seem to be using them at the expense of proper interaction ("We must make sure we look at the actual things, Austin"). The downstairs exhibits did feel a little thin, rattling through the town's history a tad fast via recently updated displays. But upstairs validated the price of admission, with galleries of Roman artefacts way beyond most civic collections. One of the finest ceramic vases of its time, ancient glassware liberated from local graves, and two of the oldest surviving (sculpted) gravestones in existence. If you pay extra you can go on a guided tour that visits the shelters in the cellar, and climbs the largest stone spiral staircase in Europe. But come for the contents, not the architecture. Hollytrees Museum: Colchester has two free museums, one in this 300 year-old townhouse by the War Memorial at the top of Castle Park. One of its early owners was gifted the castle and the surrounding land by his mother-in-law, hence the entirely unmilitary landscaping hereabouts. Today's museum has a social history feel, focusing on the house's upstairs downstairs residents, plus a room full of 20th century toys and another full of clocks. Queen Mary loved the dolls house best, apparently. I didn't linger long. Natural History Museum: A very old-school museum, this, and none the worse for that. It's housed inside a Norman church at the foot of the High Street, taken over in 1958 by a collection of stuffed animals and fossils. There's a definite focus on coastal creatures, especially birds, but also some more familiar urban dwellers including a fox to stroke. I'd have liked to read more about the Colchester earthquake of 1884, Britain's strongest for 400 years, but instead made do with avian tableaux and shark jaws. Tymperleys: There used to be a clock museum in the centre of town, I remember walking past it, but that closed down a few years back through lack of interest. Bernard Mason's hard-won collection included over 200 timepieces, including locally-built grandfathers, but none remain today. Instead the Tudor house has been transformed into an upmarket teashop and cafe, with a glass-fronted kitchen in the walled garden, and judging by yesterday's trade I'd say looks a roaring success. Bourne Mill: This is a delight, though you have to walk about a mile south from the centre of town to reach it. The National Trust took over this quirky watermill in 1936, and this year have made the bold decision to open five days a week rather than a handful of afternoons and bank holidays. Now deep in the suburbs it sits at the top of the Bourne valley, a brief notch in the landscape descending from a large millpool. The building's ornately roofed with spiky protrusions along the gable, and accessed from a waterside terrace occupied by ducks. Two lower rooms enable you to view the millwheel up close as it turns, but not grinds, relatively loudly. And then there's an upstairs room accessed by ladder, empty at present but with plans to host the odd art exhibition forthwith. The place won't detain you long, I stayed half an hour, but that included a wander in the grounds across the mill race. Stop for tea and scones and you'd linger longer (I can recommend the flapjacks). I hope the opening hours experiment works, and if you're imminently post-retirement and live in the north Essex area, you'd probably enjoy. Firstsite: One of the last Lottery-funded civic arts centres, I'd heard a lot about Firstsite and wondered what I'd find. What I found was a golden crescent, designed by the same architects who did the Walkie Talkie, sprawled across a former car park to the east of town. The lofty frontage at the western end, covered with glass, leads directly to an airy atrium. Here a member of staff awaits to greet you, a little in your face, but they get told off by management if they stand any further back. 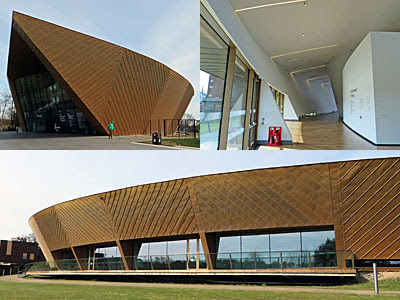 A long curving walkway leads past community rooms, toilets and the doors to an auditorium, making you wonder when the art will eventually kick in. Exhibition one at present recalls the suffragette attacks of a century ago, the gallery empty apart from 29 black-tape painting-sized borders. Only with an audio guide in hand can you discover what each work of art was and how it was slashed - a clever and thought-provoking idea. Exhibition two is less engaging, the usual stash of modern art including a room full of bathtowels with oysters and a Roman vase behind which is projected a lemon. Down the far end of the building is the cafe/restaurant, more of the former in daytime, its terrace overlooking an empty strip of lawn. And my overall impression was of a very large building full of not very much, nicely done, but echoing rather than exhilarating. The town: Colchester has a well-defined heart, rectangular in shape reflecting the old town walls. The shops are good, the usual chains topped off by narrow streets and alleyways lined by independents, particularly pedestrianised St Isaac's Walk where Essex ladies windowshop and men of Essex buy their gear. The Town Hall's tower can be seen for miles, as can the jumbo Victorian water tower behind the Post Office. 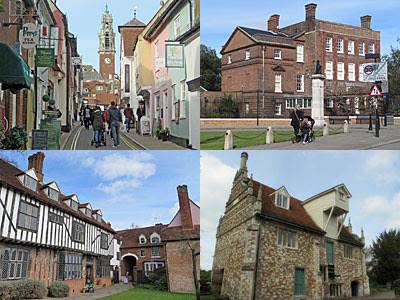 Step further out and Colchester's role as a garrison town becomes clear. It's not uncommon to see a squaddie in full uniform cycling by or out walking the dog, red beret impeccably placed. But army cuts have taken their toll, with acres of accommodation blocks demolished to be replaced by fairly bland new housing. An hour from central London by train, the town's ideal for commuting, or for any of us Londoners who fancy a busy day out.